Sue has been playing Bridge for over 40 years and has been a TD since 2012. Phil learned to play more recently and they play regularly at their local club in Rugby. When they retired 2 years ago they were looking for a new challenge and hosting for Bridge Overseas fits the bill, taking them to places they haven't visited before whilst meeting new people and getting the occasional game of Bridge. Their other interests include musical theatre and attempting to learn Ballroom Dancing. They like to keep active and Sue goes to Zumba classes while Phil goes cycling. Phil loves any sort of music and everything stops in their house for the daily PopMaster quiz on Radio 2. Chris and Alison became bridge partners many years ago, marrying a year after meeting over the cards. Both are experienced bridge players and bridge teachers, while Chris is also a qualified EBU county director. They have been successfully running their own bridge club together for several years, seeing a steady flow of new recruits to the game through their innovative teaching sessions. Their aim is for people to enjoy this fun and stimulating game as much as they do and they hope to ensure that every holiday comes up trumps! 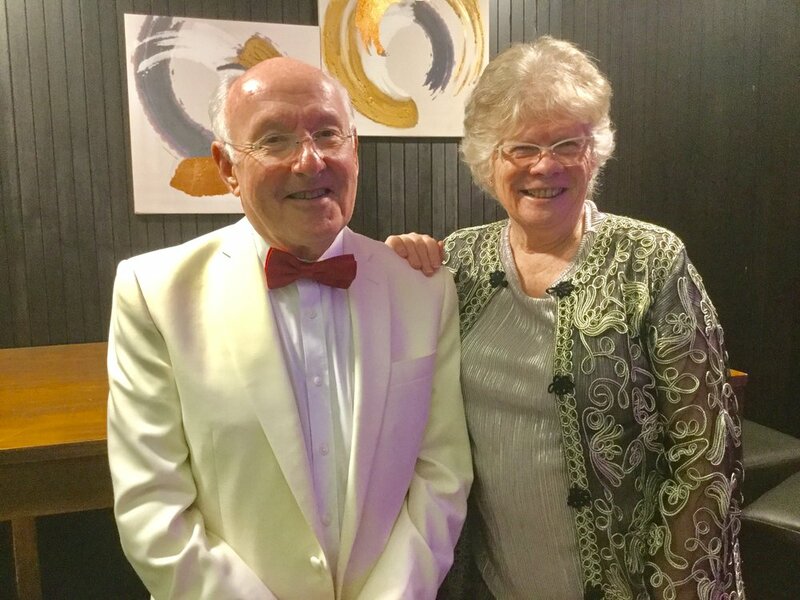 Mike and Jeanne have been playing regular club bridge for over 20 years and during this time Mike has qualified as a bridge director, cruise director and teacher. Since retiring in 2014 Mike has been teaching bridge to small groups of beginners and improvers in south Somerset and is delighted to see many of his trainees make the transition to playing at local clubs. Mike and Jeanne took over running an annual bridge break in Bournemouth 5 years ago and are encouraged to see the event grow from 8 tables to 16. They have also organised numerous bridge themed fund raising events for charities in Somerset. Away from the bridge table, Mike is an amateur football referee now in his 40th season whilst Jeanne enjoys gardening, live music gigs and yoga. They both love travel and adding bridge into the mix seems destined to be an ideal combination. "I am in my 5th year of directing for Bridge Overseas, starting from scratch I have now done 130 holidays, mostly in the UK but occasionally doing one overseas. I moved to Dolgellau nearly 5 years ago, where Julie has lived for 27 years. Prior to that I was a competitive bridge player, representing Wales on over 50 occasions and achieving a target of winning the home international series in 2011, it had taken Wales 73 years to do this. Like all our regular director’s I seem to have built up a number of “regulars” and in fact on a recent holiday in Llandudno I had met 38 of the 40 people on the holiday before, most more than once. Being a LIST type of person I have so far met over 2500 different customers which is still only about a quarter of those on Bridge Overseas database, I believe Due to the large volume of holidays I do my wife Julie does a much lower number, she has done 40 to date and over the years I have developed a great number of hosts to help me, of which current regular ones are Belinda, Bron, Jenny, Jennifer, Kate, Linda, Rosey and Sneh- strictly listed in first name order rather than bridge ability. With so much time spent indoors away from bridge although we both enjoy walking, whereas Julie is keen on doing a short walk daily I tend to set myself challenges and my current one is to climb all the Wainwright’s, of which there are 214, in the Lake District. So far I have done 65. I have previously completed the South West coastal path which goes from Minehead to Poole- it did take me 10 years. It is obviously a family thing as my sister is now doing the same, all in stages. I also am trying to do as many Sustran’s cycle routes as I can find the time for, with my next ones being The Way of Roses and then back from Whitby to Barrow on Furness, an 8 day project of about 350 miles Julie tends to lean towards more creative pastimes , involved in a local writing group, singing and music groups and using time I am away to keep in touch with her long standing friends in the area. I have it in mind to attempt Land’s End to John O’ Groats in my 60th year. I often get asked which is my favourite venue and I am always hard pushed to think of a reply because what is important to me is different to what is important to a customer. I like the hotels which give continuity of staff and good service and funnily enough these tend to be those with low stars, Fishguard, Bournemouth and Llandudno. My wife would give different favourites. We do both agree on the venues abroad we have been to – Montecatini and Slovenia and in fact are going back to Montecatini later this year, where I am playing rather than directing." "Malcolm & Madeleine hold the distinction of being our longest serving Directors, in fact they were guests on our very first English bridge holiday in Harrogate. They live in the seaside town of Southport and have been married for over 40 years and have three grown up children and six grandchildren. When Malcolm retired from running a successful textile manufacturing company, the opportunity arose to take over the part time management of Southport Bridge Club, the 10th largest club in the country with 300 members. Malcolm is a qualified E.B.U Director and a members of The English Bridge Union Teachers Association, and runs classes for beginners and improvers,helping to increase the membership. 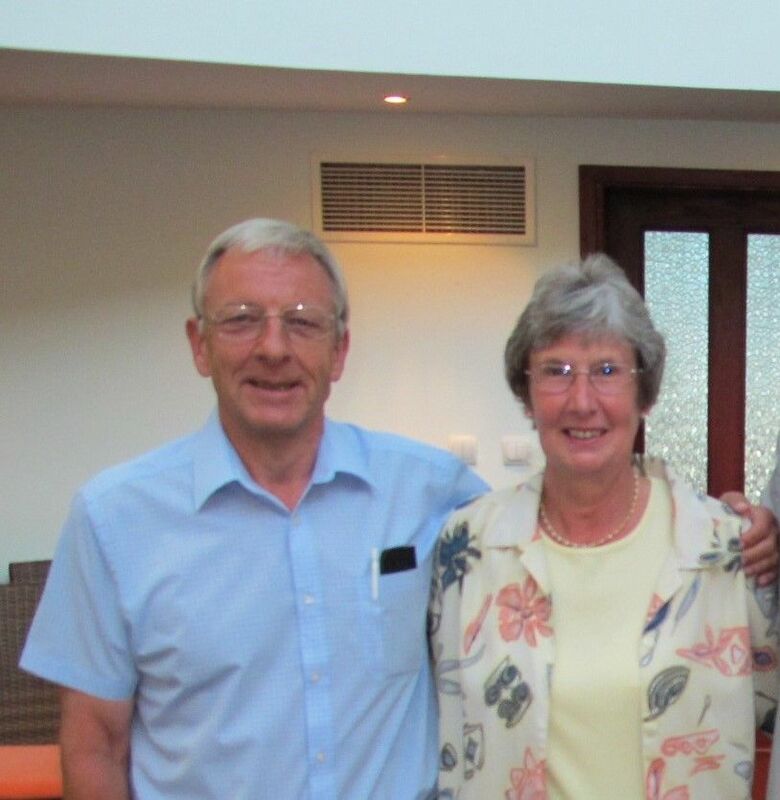 Malcolm & Madeleine have been playing duplicate bridge for over 30 years and have the honour of representing their county Lancashire. Madeleine retired from running Britain's only Lawnmower museum in Southport, and acts as a host with her calming manner being much appreciated by the many guests who have played with her over the past 15 years. They are often asked which is their favourite U.K. venue and the answer is Telford in Shropshire, where they direct on Bank Holidays and New Year, meeting up with regular guests who have become friends over the years. Malcolm's Bridge seminars are well known for their humour and informative bridge tips and are not to be missed! He is also a lifelong suffering supporter of Everton Football Club, and helps run a fish and chip shop in his spare time! Malcolm's favourite saying in the Bridge Room, is to remind players that the opposition is sat to the left and right, not opposite! Something we should all try to remember." "Ian has been a director for more than 20 years becoming the SBU Chief National Director before recently retiring from that position. During that time he has organised many local, national and international events in Scotland. Liz and Ian started running bridge holidays over 15 years ago. Their aim is to provide the best possible overall holiday experience where the bridge is well organised but with an emphasis on a relaxed, friendly atmosphere so that all players, regardless of ability or experience, can have an enjoyable game." " Married in Seaford, East Sussex in 1971, Joy and Colin joined Silvermere Golf and Country Club having moved to Weybridge in Surrey in 1977. It was there that they started to play golf and bridge. They moved around Surrey with their jobs and played both golf and bridge at Kingswood Golf Club from 1981 to 1986 and then West Byfleet Golf Club from 1986 to 2001. In 1991, (with a lot of help from Chris Stableford – well known to Surrey bridge players) Joy and Colin formed the West Byfleet Golf Club Bridge Section which they ran for 10 years on Monday nights. On average, there were nine tables playing duplicate bridge and four tables receiving tuition. A large number of players new to the game received instruction and many became very competent indeed. In 2001, they moved back “home” to Seaford and Joy in particular was able to spend a lot of time redesigning and working on what is now a lovely garden. Joy is a particularly good gardener – Colin is often told “Don’t step on that”! They joined one of the local bridge clubs (Southdown Bridge Club) and in 2008 Colin was asked to become Chairman - a post he held for eight years. Joy and Colin still teach bridge to many players in and around the Seaford area which is very popular. In September 2005, they started directing holidays for Bridge Overseas and since that date they have directed for over 100 weeks (over two years!). They say “We do not regard directing for Bridge Overseas as work because it really is such fun” and they believe this is the key to their success – bridge should be fun and enjoyed as much as the holiday you are on. They run excellent workshops on all of their holidays looking at hands from the previous evening and these are very popular." "Graham lives in Hampshire and has been running bridge clubs, teaching and directing for many years. Graham & Lona will be at the Holiday Inn Windsor/Maidenhead this February and at Whately Hall Hotel in Banbury on the 14th of March 2019. "Since their full time work commitments reduced Pat and Glenda have been able to build on their enthusiasm for bridge and have thrown themselves wholeheartedly into the game. They are very involved members of their clubs - both having qualified as EBU directors and Pat as a bridge teacher. They enjoy their breaks away and their aim is to make sure that all those with them on holiday do too. Glenda is a very active person - a keen walker and tennis player while Pat enjoys music, theatres and galleries sometimes persuading Glenda to go along – while Glenda encourages Pat to join in an occasional game of bowls. They both enjoy exploring the local sights and afternoons in the sun. It’s a good partnership!" "A Past President of the Scottish Bridge Union and a Grand Master, Russell has been teaching bridge and directing tournaments for many years. He is also experienced at running Bridge Overseas holidays, both abroad and in the UK. Russell's wife Christine is still a bridge novice but has several years' experience at helping him to host bridge events. She is well used to looking after players' needs and, if required, can also make up the numbers to avoid the inconvenience of having a half table."